The Baltimore City Archives has an extensive collection of maps, both in facsimile and original. A two-volume typescript index (provided as a text-indexed pdf here) and an index compiled by Rebecca Gunby, Index of Streets and Alleys found in Records, Plats, Atlases and Miscellaneous Drawings at the Baltimore City Archives provides access to the majority of maps in the collection. Search there by street name and to a lesser extent by neighborhood (such as Roland Park). An alternate index provides an index to the originals, many which are now missing. We also have a map index (this is a large pdf, so it may take some time to view) which is very instructive for finding maps in our collections. The first 3/4th of this document contains a list of our maps, organized chronologically. After that list are two separate A-Z indexes of the map list. The numbers in the indexes correlate with the numbers at the beginning of each entry in the map list (1.-396. are typed and then 397.-890. are handwritten). So in other words, in the first A-Z index, the first entry, Abey Alley, is located on map number 627 in the list previous, which is “1841 “Plat No. 1 of Abey Alley””. This document is searchable, so if you hit Ctrl+F, you can type in a word or phrase to search for. Street names changed over the years. Please consult with Duvall’s Practical Points for Conveyancers for old/new street names. Street numbers have also changed as well- the most prominent change happening in 1887. Take a look at those changes in the 1887 City Directory. Most maps in our collection are located in BRG12 and BMS10. The study of Baltimore City should begin with a good overview understanding of its geographic and demographic growth. The mapping of the City is discussed at length in Sherry Olson’s Baltimore, and in Edward Papenfuse and Joseph M. Coale’s Atlas of Historical Maps of Maryland. Attached is a large pdf of a map showing the streets and wards of Baltimore in 1935. The map accompanied Frederick Stieff’s The Government of a Great American City (Baltimore: H. G. Roebuck & Son, 1935). The Baltimore City Archives has nearly three complete reference sets of the Sanborn maps of Baltimore City available in the search room of the Archives. They are copies that were updated by the Sanborn map company through the 1950s and contain pasted down changes in buildings through the last date of update for each volume. The Library of Congress Geography and Map Division maintains an excellent, if not complete bibliography of the Sanborn Insurance maps on line and has begun to provide excellent images on line as well, although not yet of Baltimore. The Digital Sanborn Maps provided by the Pratt library is one of the most important mapping resources for the City for the first half of the 20th Century and will be enormously helpful for providing a sense of place for your case study. Note that to access them, you will need a Pratt Library card or one from a county library that has reciprocity with Pratt. 2) Sanborn Insurance maps for Baltimore City to 1963: Maryland State Archives copies derived from microfilm purchased from the Library of Congress are now on line for personal and educational use only. For an introduction to the Sanborn maps see: intro_sanborn.pdf. For a Baltimore street and street number index to the Sanborn maps as of 1945, see: bc_sanborn_street_index.pdf. 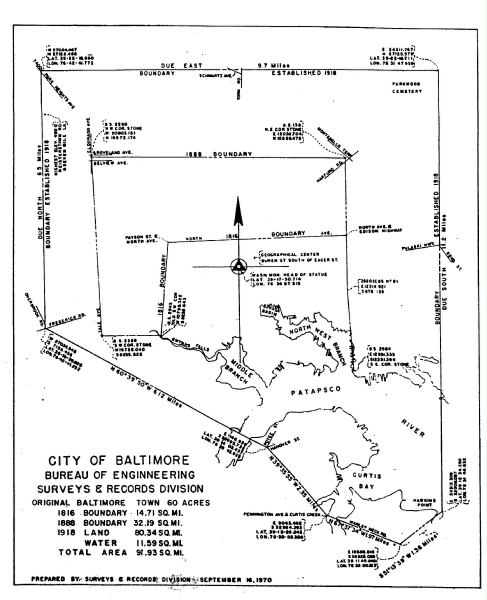 3) Baltimore began recording land transactions by city blocks in 1851. Baltimore Block Books are available through the Maryland Land Records website. See more information on the Maryland State Archives web site here. The best maps of Baltimore City blocks with their block numbers are to be found in the Bromley Atlases for the City (see above), a 1991 atlas, Baltimore City Block maps, part 1, as of April 2005 (thumbnails), and Baltimore City Block maps, part 2, as of April 2005 (thumbnails). Note that attempting to trace the ownership and occupancy of property in Baltimore City is complicated by ground rents. For a legal explanation of ground rents see Frank A. Kaufman’s article in the Maryland Law Review, Volume 5, issue 1, 1940, The Maryland Ground Rent – Mysterious but Beneficial. For the history of ground rents in Baltimore City, one of the best sources is Parceling Out Land in Baltimore, 1632-1796 by Garrett Power (reprinted from the Maryland Historical Magazine in 1993). Another useful study is Ground Rents in Maryland with an Introduction concerning the Tenure of land under the Proprietary, by Lewis Mayer, 1883. See also Professor Power’s comparative study of Baltimore and Birmingham, England. For an example of the difficulty in tracing ground rents see Documenting Ground Rents in Baltimore City. 4) Baltimore City and County Aerial Photographic Map Atlas, created in 1926-1927 for the Department of Public Works Water and Wastewater, located in our collection at BRG47-39. City of Baltimore, Reproduction of the Use District Map as Amended to January 1, 1958 Part of the Zoning Ordinance. Arnold, Joseph L. “Suburban Growth and Municipal Annexation in Baltimore, 1745-1918” Maryland Historical Magazine (June 1978): 109-128. Cox, Richard C. “Understanding the Monumental City: A Bibliographical Essay on Baltimore History” Maryland Historical Magazine (March 1982): 70-111. Cox, Richard C. “Trouble on the Chain Gang: City Surveying, Maps, and the Absence of Urban Planning in Baltimore, 1730-1823; With a Checklist of Maps of the Period.” Maryland Historical Magazine (Spring 1986): 8-49. Lefurgy, William G., “Baltimore’s Wards, 1797-1978: A Guide” Maryland Historical Magazine (June 1980): 145-153. Smith, Dawn Beitler. Index to the Map of the City and County of Balitmore, 1850, by J. C. Sidney and P. J. Browne, n. d. (searchable pdf derived from uncopyrighted typescript printed by Family Line Publications, Westminster, Maryland). should prove helpful, but should be used with caution. Street name changes, renumbering schemes, and block number confusion between City and State over time may make it difficult to locate the site of a case or the residences of the litigants. Also, the imap service is not always accurate as to address. When first used to locate Poe’s grave, it placed Westminster Church a few blocks away from its actual location. I suspect this has been corrected by now, but accurate on-line mapping , as anyone who has used the various versions of Mapquest knows, may get you to the wrong place. 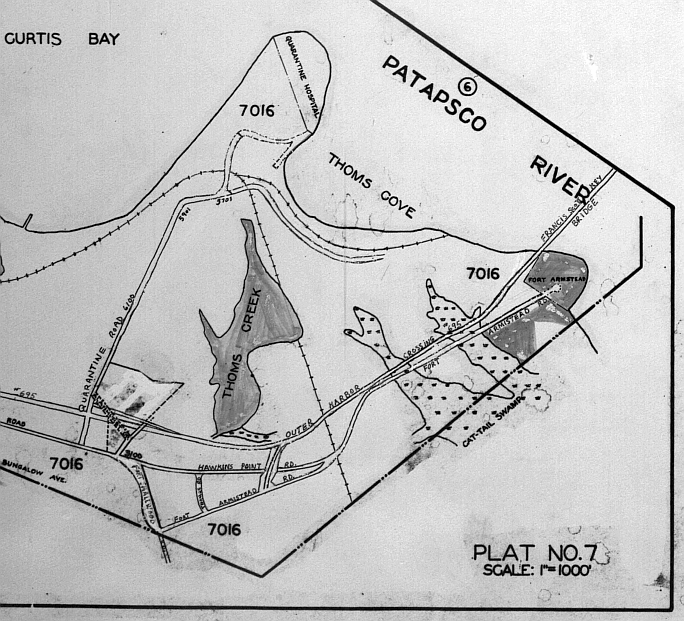 To illustrate finding the history of a property involved in a case, one of the more difficult examples was chosen, the location of the property at the heart of Maryland Port Administration v. QC Corp., 310 Md 379, 1987, thought to be once identified on maps as 3800 Hawkins Point Road. In using imap to locate 3800 Hawkins Point Road, only the street name can be used, being careful to include road in the drop down box and not the address box. Even then, the closest you will come to 3800 is 3500 Hawkins Point Road. Still, the imap provides a current neighborhood view including census tract data, and other useful current information about that location, including 2006 aerial photography. For any property in Maryland still on the tax rolls, you can also use http://mdlandrec.net (apply for a user name and password–it is free), but first you will need to obtain the block number in which the property of interest is located. For any current address that is on the tax rolls, you should be able to obtain a current block number from the State Department of Assessment and Taxation website, but again caution needs to be exercised. The Court system which records deeds has been known to use block numbers that are different from those used on the tax rolls. 3510 Hawkins Point Road, which is Ward – 25 Section – 09 Block – 7005 Lot – 017. “2 It appears that M[aryland] P[ort] Authority is both the owner of the underlying fee and a sub-sublessee of its own property.” In addition the Court also pointed out that the land was not always in Baltimore City (not until 1919). “1 In 1883, when the area was part of Anne Arundel County, the City of Baltimore established near Hawkins Point a quarantine station against contagious diseases brought toward the City by water. See Baltimore City v. Fairfield Improvement Co., 87 Md. 352, 359, 39 A. 1081, 1082 (1898).” (http://www.msa.md.gov/megafile/msa/speccol/sc5300/sc5339/000209/000000/000025/restricted/msa_sc5458_000051_003519-5.pdf, pdf, pp. 1, 3). There you will find that the whole area involved in the Court case is recorded under block 7016. With this block number, 7016, you then can turn to the block books and find as complete a record of the ownership of the property in question as was recorded by the Clerk of Court for Baltimore City. Note that leases and sub-leases may not be found among the deeds recorded at the Court. All State Property is supposed to be recorded at the State Archives through files transferred by the Maryland Department of General Services according to the Annotated Code of Maryland. What that means is that leases of the Maryland Port Authority ultimately should be recorded at the Archives. The effort to trace the history of the property in question may indeed prove worthwhile. As an example, the pages of the block book for 1967-1976 related to block 7016 are attached to this html in a pdf derived from the on-line images. Clearly this is a block of public and private land owners who would be affected by toxic wastes dumped anywhere in the vicinity. 1930 census lists her living on River Neck Rd. Legal description of property in BA land recs.